Quick Admin Note: The winners of the Food in Jars giveaway are Tom Wagtowicz, Colleen Alexander, and Emily Holbrook! If you happen to read this before you get my email then shoot me your address and I’ll send your book! So it turns out that I’ve come a very long way of what I consider to be a perfect cinnamon roll. 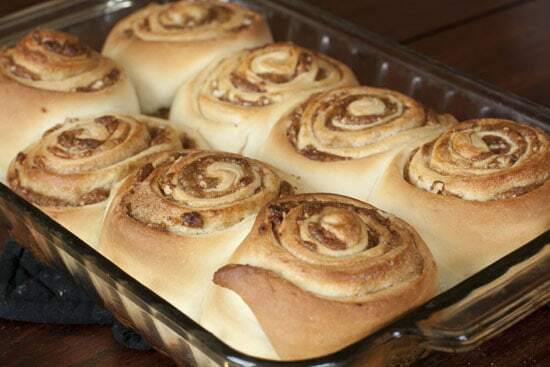 I used to think that THESE were the perfect cinnamon rolls. While those are very good cinnamon rolls, I’m not sure that they can hold a candle to these bad boys. The photos alone should be evidence to that. These Date Cinnamon Rolls are so soft and fluffy and once you bite into them they are filled with this crazy date mixture that’s almost like a sticky bun. After I pulled these out of the oven I had a moment of insanity where I thought I should open a food truck that just serves these. I think it would do well, but I would also get diabetes. 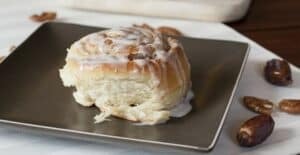 These big fluffy cinnamon rolls with a sweet date and pecan filling are incredibly decadent and delicious. You will love them! 1) Cut dates in half and remove pits. Add to a food processor with sugar and pulse until combined. 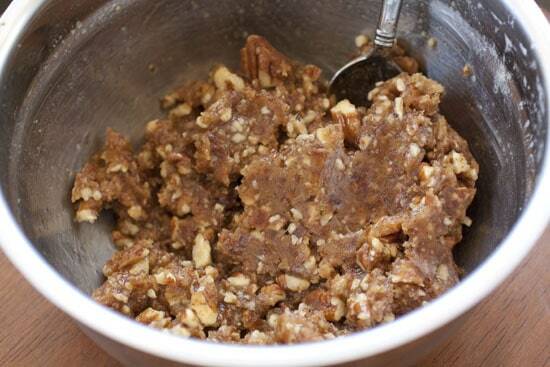 2) Add to a bowl along with other filling ingredients except for the brown sugar. Stir to combine. 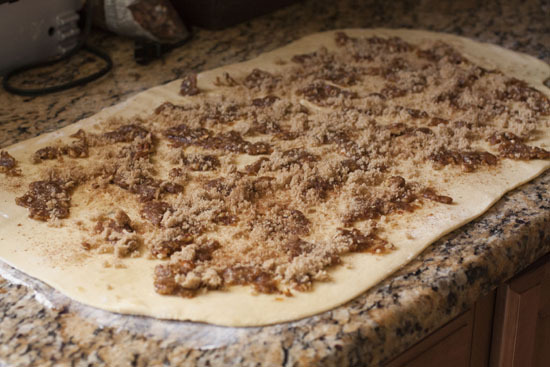 2) Sprinkle date filling over the surface of the dough. Then sprinkle entire surface with brown sugar. 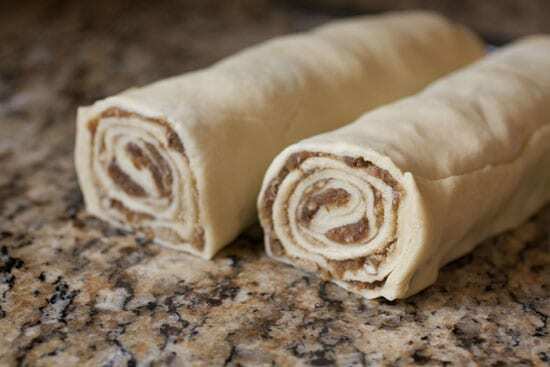 3) Roll dough starting from the short end so you are creating as many layers as possible. Roll tightly and once rolled, try to even out the roll so each part is the same thickness. 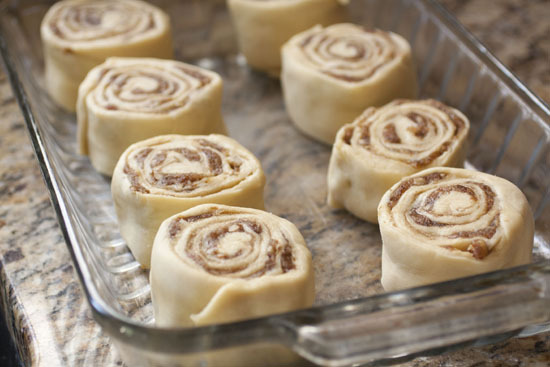 4) Cut rolls into 8 even pieces and add to a large, lightly buttered baking dish. 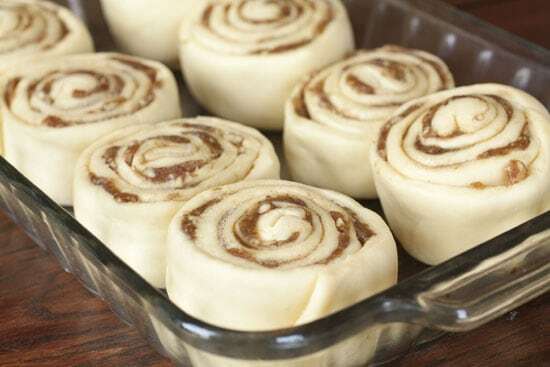 6) Bake rolls in a preheated 375 degree oven for 25-30 minutes until they are nicely browned around the edges. This is a pretty standard enriched dough. The eggs and sugar make it really soft and delicious. 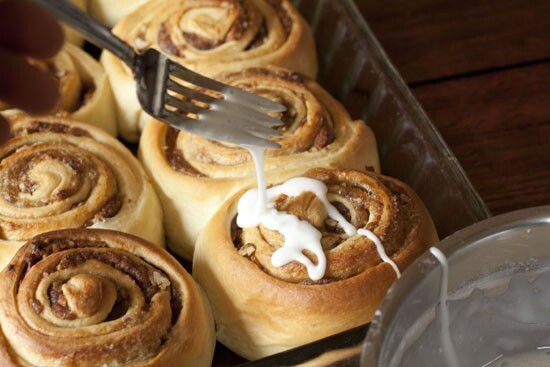 It’s totally worth the work to make it yourself if you want some good cinnamon rolls. Start by mixing the yeast, 1/2 teaspoon sugar, and water in a mixing bowl (top left). Let it proof for about ten minutes until it’s foaming and all the yeast is dissolved. Then stir in all your other dough ingredients except the flour and butter. I like to use a stand mixer to make this, but you can definitely do it by hand as well. If you use a stand mixer, add the flour and start mixing the dough with the dough hook until it’s all combined, about 4-5 minutes. Then beat in the softened butter and continue to beat the dough until it’s very soft. If the dough is super-sticky, add another 1/4-1/2 cup of flour. It’s okay if it is a little sticky though. 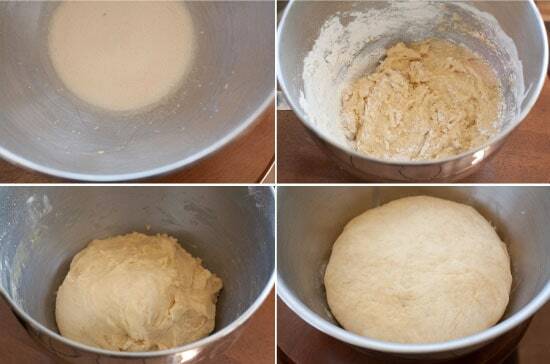 If you do this by hand, just use a big spoon to stir all the ingredients together and then use your hand to vigorously work the dough in the bowl until it comes together in a soft ball. Again, if it is super-sticky and wet, add more flour, but try not to add to much. You don’t want a dry dough for this. Once your dough is pulled together, add it to a clean bowl and dust it with flour. Then cover it and let it rise for about two hours at room temperature. 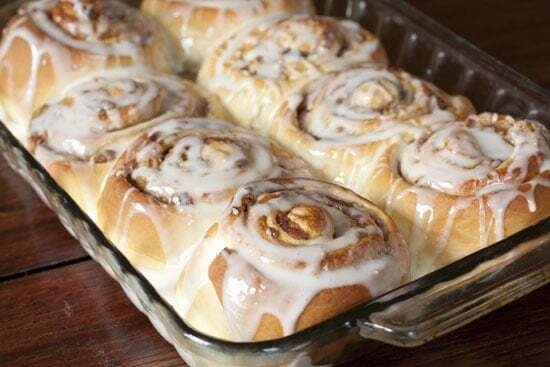 Most cinnamon roll fillings are just butter and cinnamon and brown sugar. Let me go on record as saying that there is absolutely nothing wrong with that. But these are good also. 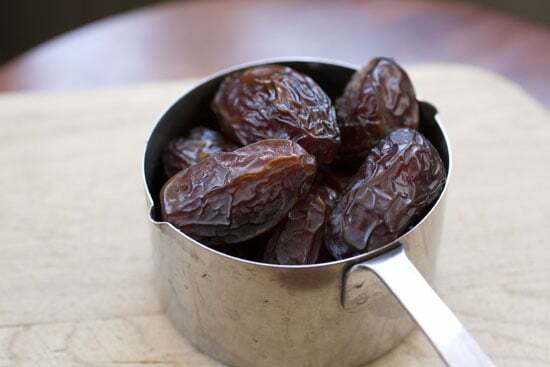 The thing about dates is that they make a really thick and sticky filling. It just has more oomph to it. And when we are talking about cinnamon rolls, oomph is good. To make the filling, cut the dates in half and remove the large pits. Then process them into a paste with the sugar. I used a food processor but if you don’t have one, you could just mash the dates and sugar together with a fork. They are really soft and mashable. Mix together all the filling ingredients except the brown sugar. Once your dough has doubled in size, turn it out onto a floured surface and roll it out into a large rectangle. It should be about twice as long as it is wide. Mine was about 12×24 inches. Then sprinkle on the date filling. Note that you will not be able to spread this filling so just kind of dot it all over the place and mash it down a bit so it’s flattened. Then sprinkle the brown sugar all over the top. The sugar will kind of fill in the spaces. 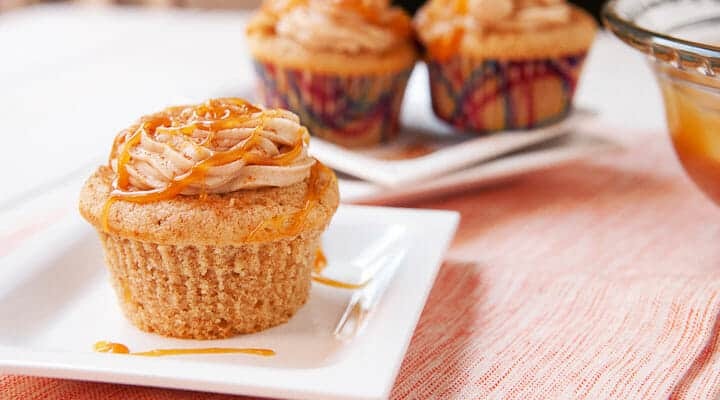 A bit of brown sugar never hurts. Roll from the short end of the dough so you are rolling the longest way possible and therefore creating a bunch of layers. Once the roll is, well, rolled, try to even it out so the entire thing is the same thickness. Then just chop it into eight even pieces. The easiest way to do this is to cut it in half and then cut those pieces in half and keep going until you have eight big rolls. Put these bad boys in a lightly buttered baking dish. They might look small at the moment, but don’t worry. That will change. Cover the rolls and let them rise for another hour. They should plump up beautifully. Then bake the rolls at 375 degrees for about 25-30 minutes. They should be golden brown and the date filling will be starting to bubble out of the rolls. The hard part is waiting. It’s really best to let them cool for about thirty minutes before you try to ice them or eat them. They are just too hot to work with right now. 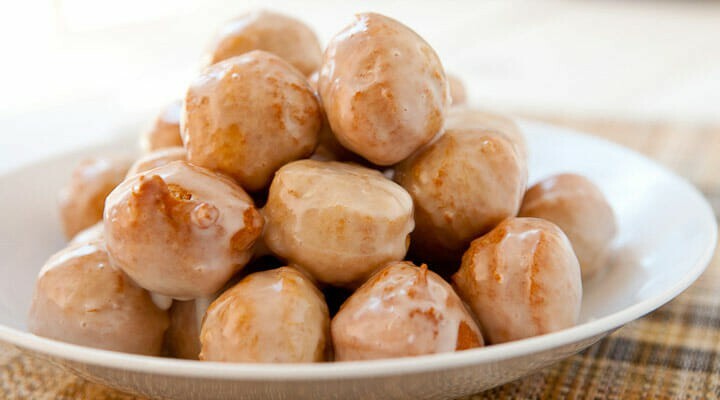 Once they do cool though, you can drizzle on the simple powdered sugar glaze. Go heavy on the the icing. I like to go pretty heavy on the glaze! 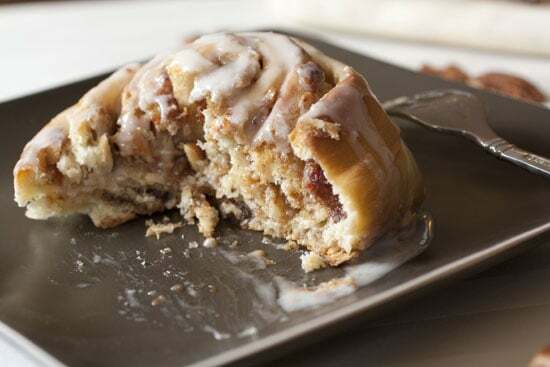 Biting into one of these Date Cinnamon Rolls is wonderful. The dough is light and fluffy and the filling is sticky and delicious while not being too sweet. It’s the best cinnamon roll I’ve had in memory. I dare you to make these and not love them. Also, of I did start a food truck that sold these it would be called NICK’S BUNS. Omg you’re killing me here! The dates aree brilliant. I want to make these right this second but, alas, I’m headed out the door and won’t have time to cook until next weekend. What a bummer! Ha! Nick Cage is the man. His movies are either fantastic or horrible. I love your recipes! I make a similar recipe every couple of weeks for my kids’ breakfast, with golden raisins instead of dates. Love cinnamon rolls!!! 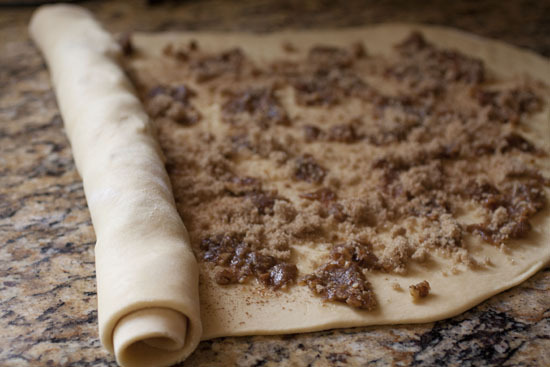 A tip: use dental floss (plain, not mint) to cut the rolled up dough. You just wrap it around and then pull. It cuts outside in with even pressure all around so you don’t have any problems squishing the dough. How many teaspoons or tablespoons of dry yeast ? Hi Lama, that amount of dry yeast works out to be about 2.25 teaspoons. Good luck! Thank you! We had these, hot out of the oven, for breakfast this morning. My boys and I prepared these last night. So, this morning I pulled them out of the refrigerator, let them sit for 1 hour, and then, baked according to your instructions. Could not have been a more perfect recipe! Sticky buns are our annul Xmas breakfast before opening presents. 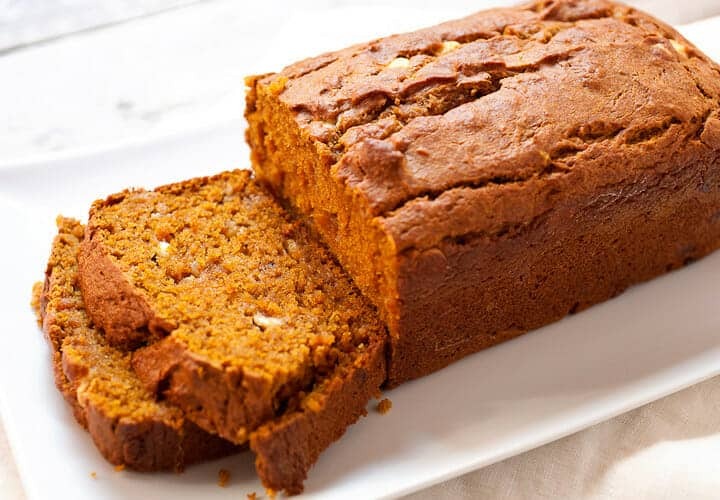 Each year the dough varies…from using puréed pumpkin but this extra eggy and buttery one turned out layered. The indies with the yeast was pretty incredible with the toasted pecans. I was worried that the whole thing might be too sweet but the whole thing was nothing less than stellar. But since it had to be sticky buns, I had to put a little honey, corn syrup, and more toasted pecans on the baking pan before putting the rolls on. Once a year, right??!! Thank you so much for this fantastic recipe. We will all be in a diabetic comatose state soon. I made these rolls and found them to be sickeningly sweet. Also, the proportions on the icing recipe seem off because my icing came out way too runny and soaked into the rolls. I made the rolls again and this time I cut the filling sugar in half, cut the milk in the icing in half and cut the overall icing recipe in half. These came out just right. Delicious! Hey Matt, sorry you found the original too sweet. Nice work adjusting though! Looooved this. I altered it a bit to include more dates and less processed sugar. I made the dates into a paste by cooking them in a cup of water and then mashing them with all the spices. The result was a delicious, not over-bearingly sweet bun. And no blood pressure spike! Thanks for the great idea!! Those sound like great changes Alma. Thanks for the comment! Add lemon peel and juce, plus cardamom and these rolls rock. Ummm, did I miss something? What is the water temperature supposed to be that the yeast is proofing in?